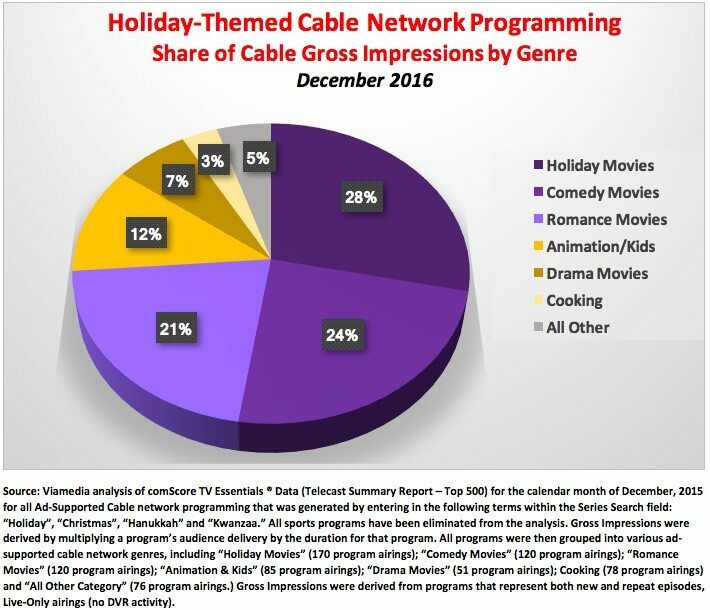 “Home for the holidays” conjures many images, and when it comes to watching television during the month of December, that image is probably ad-supported cable television, which accrues over three-fourths of all gross impressions associated with holiday-themed TV programming. As 2016 winds down with the holiday season and New Year’s fast approaching, we thought we’d depart from our standard blog format and concentrate – not on a particular show or major sport – but rather on cable programming thematically linked to the upcoming holiday season. 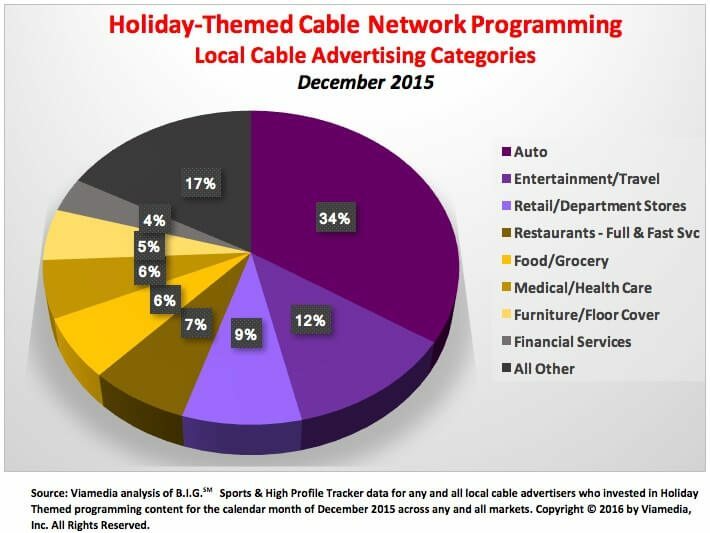 Source: Viamedia analysis of comScore TV Essentials ® Data (Telecast Summary Report – Top 500) for the calendar month of December, 2015 for all programming that was generated by entering the following terms within the Series Search field: “Holiday”, “Christmas”, “Hanukkah” and “Kwanzaa.” All sports programs have been eliminated from the analysis. Gross Impressions were derived by multiplying a program’s audience delivery by the duration for that program. All programs were then grouped into one of three sources of viewing: Ad-Supported Cable (700 total program airings); Broadcast Network TV (69 total program airings); and Pay Cable & Home Shopping Networks (232 total program airings.) Gross Impressions were derived from programs that represent both new and repeat episodes, Live-Only airings (no DVR activity). 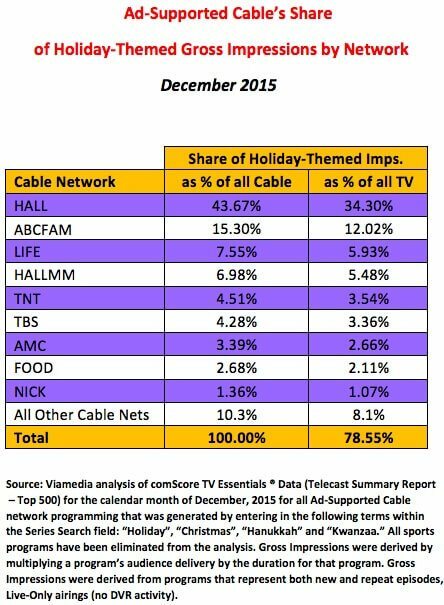 There is tremendous demand for Holiday-themed programming during the last month of the year and we estimate that 3-5% of total Viamedia company-wide advertising dollars accrue to such programming. Last December 2015, over 1,400 clients ordered 82,000 30-second spots on holiday programming across 71 Viamedia markets (practically our entire nation-wide footprint.) That comes to an average of 56 commercial units per client over the month of December. Not surprisingly, the three networks that delivered the greatest number of Gross Impressions also received the greatest level of local cable advertising support. 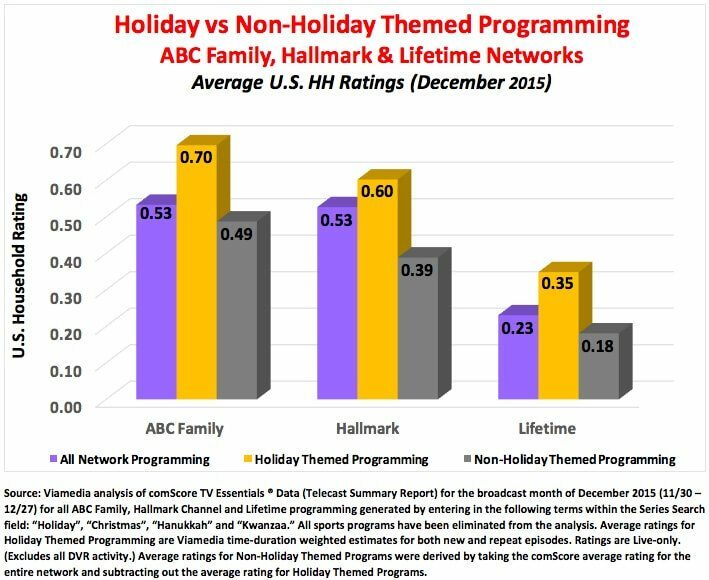 Collectively, Hallmark Channel, ABC Family and Lifetime accounted for two-thirds of all holiday-themed cable impressions and 61% of all advertising dollars.